This item is not available for purchase online. Please call (920) 965-2085 for more information. 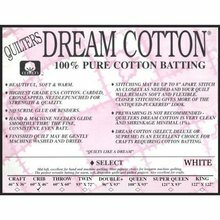 Quilters Dream Natural Select Cotton, King 122" x 122", starts with the finest USA cotton and is carded, crosslapped and specially needlepunched for strength. No stiff scrim to resist your needle. Select quilt batting is a mid-loft batting for hand quilting, machine quilting and crafts that will accept stitches up to 8" apart.